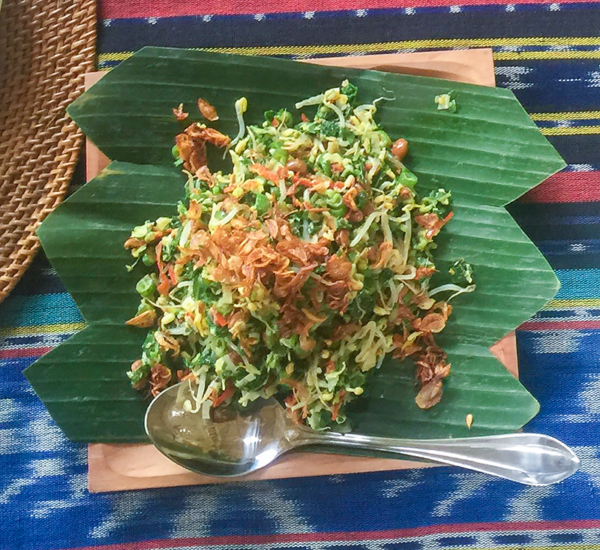 Balinese Urab is a salad made with any of a wide range of vegetables. You can use whatever vegetables you like – I used green beans in this recipe and added red lentils – the variation I learned in my cooking class. Balinese red bean salad: Urab. 30 seconds to a minute but not cooking completely. (This might be harder to find but specialty Asian markets usually have fresh kaffir lime leaves. If you can’t find fresh leaves, use dried, but do not substitute anything else, as the taste is so distinct it can’t be mocked). Mix the coconut, red bean and base genep with your hands very well. You can mix so well that you start to mash the beans slightly but do not over mash, keeping most whole. Add the blanched green beans and bean sprouts. Add half of the fried shallots and kaffir lime leaves. Use a pinch of salt to taste. Mix well and garnish with remaining fried shallots.